Be the first to share your favorite memory, photo or story of Bishop Anthony. This memorial page is dedicated for family, friends and future generations to celebrate the life of their loved one. Bishop Anthony Michael Milone was born on September 24, 1932 to Joseph and Louise Milone in Omaha, Nebraska. He was the son of Sicilian immigrants and one of nine children who grew up in Omaha’s “Little Italy” neighborhood. Bishop Anthony attended Lincoln Elementary school and Creighton Preparatory School. His college years were spent at Conception College in Missouri, a school for men considering the Seminary. Four years later, he was accepted as a student at Gregorian University in Rome where he was ordained a priest in 1957. Following his ordination, Father Milone had assignments as Assistant Pastor of St. Mary’s in Bellevue, St. Patrick’s in O’Neill, and Our Lady of Lourdes in Omaha. He went on to become Pastor of St. Anne’s in Dixon, Immaculate Conception Mission, Waterbury, and St. Bernadette’s in Omaha. Father Milone was appointed Auxiliary Bishop in Omaha in 1981, and on January 6, 1982 family, friends, clergy and parishioners were with him in Rome when Pope John Paul II ordained him a Bishop in the Basilica of St. Peter in Vatican City. 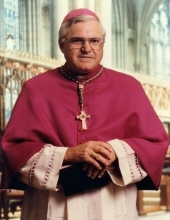 In 1988, Bishop Milone was installed as the sixth bishop of the Diocese of Great Falls-Billings, Montana. Retirement came in 2007. Bishop Milone came back to Omaha where lived in residence at St. Bernadette’s and then at St. John Vianney Residence. He continued his work as a Shepherd of the church. In his spare time, he enjoyed playing golf, fly-fishing, watching his beloved New York Yankees and Nebraska Football. He loved being an uncle, teaching us about our Sicilian heritage, to laugh often, and to always love one another. Bishop Milone was a simple man who loved spending time with his family teaching us how to care for others and the power of prayer. He lived his life modeling humility, demonstrating kindness, and sharing his love for all. When Pope John Paul II ordained him Bishop in Rome, the Pontiff told him “…to be a light to the world.” Bishop Milone believed this meant he was to help people to recognize their dignity. To send flowers or a remembrance gift to the family of Bishop Anthony Michael Milone, please visit our Tribute Store. Reception of the Body 03:00 PM with Office of the Dead at 07:00 PM at St. Cecilia Cathedral. "Email Address" would like to share the life celebration of Bishop Anthony Michael Milone. Click on the "link" to go to share a favorite memory or leave a condolence message for the family.